The Federal Rules of Civil Procedure (“FRCP”) govern court procedure for civil cases (rather than criminal cases, which are governed by the Federal Rules of Criminal Procedure) in United States Federal District Courts. While the rules apply to practice in all US District Courts, many courts also issue their own rules that relate to specific procedural requirements when practicing before those courts. Prior to 1938, federal courts had separate rules for civil cases in suits in equity and suits at law. (For an explanation of the difference between equity and law, this article may be of help). In 1938, the Supreme Court issued the current modern rules of civil procedure, abolishing separate rules for equity. The rules have continued to be amended over time, with the latest rewrite, to improve style and consistency, in 2007. 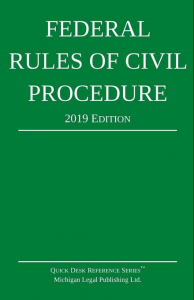 This online edition of the Federal Rules of Civil Procedure is designed for ease of use and works well both on the desktop browser and on mobile devices. Rules are cross-linked for easy access and the notes on each rule’s history include links to cited cases and statutes. This site is updated annually as the rules are modified and amended, so you can be sure you’re always up to date. This site has been updated with all amendments to the rules for 2019.